Robert Edsel and Bret Witter, who wrote the true life history on which The Monuments Men was based, describe the original of George Clooney’s character in the movie, a Harvard-trained art conservator and historian named George Stout, as someone who "exuded knowledge, professionalism, and the pure love of and respect for cultural objects." I don’t know quite how he does it, but Mr Clooney, who also directs, somehow manages to make this man, now renamed Frank Stokes, into just the opposite: a supposed scholar with no apparent knowledge nor passion nor even much interest in art, except in the most banal and general terms, in which he talks about it even to his supposed professional colleagues. As if to confirm that impression, the real life George Clooney was recently quoted in the media as saying he thought it would be a good idea for the British Museum to return the Elgin Marbles to the "Pantheon," whither he imagined they had been taken. Throughout the movie it is all too easy to see through the supposed art expert to the rather dim actor and celebrity beneath. To be honest, I was less surprised that The Monuments Men was bad than I was at how bad it is. Not just bad, either, but incompetent as a bit of film-making. There are lots of bad movies that are at least made with a certain craftsmanship that one may admire for its own sake. Indeed, the entire scholarly discipline of "film studies" seems to me to be dedicated to that proposition. But I’m afraid you’d have to say on the basis of Monuments Men that Mr Clooney is as clueless about movie-making as he is about art history. He simply doesn’t know what he’s doing. There isn’t any attempt to build narrative continuity between one scene and the next, nor much in the way of suspense or emotional tension within the confusingly discrete scenes. So far from appearing to be dedicated art lovers, passionately concerned about the fate of Europe’s cultural heritage, these celebrities, dressed unconvincingly as World War II soldiers in pursuit of Nazi art-thieves, don’t seem to know what they are doing either. The affect of both characters and story-telling is completely flat. At one point we cut to a card telling us that the scene before us is meant to be the (quite famous) "Battle of the Bulge" — and yet there is nothing beside the card to tell us that there is a battle at all, let alone the especially savage one in the snow and the cold that nearly everybody knows the Battle of the Bulge to have been. The only reminder of the war here is Mr Clooney’s Frank Stokes turning up from somewhere or other and bringing with him an anonymous wounded man to a hospital tent. There the doctor, played by his producing partner Grant Heslov, reassures the wounded man that he’ll be all right. It doesn’t look to us as if he’ll be all right. But then the man, whoever he is, is quickly forgotten about anyway, so who cares? Much more interesting is Bill Murray’s hearing a record of his grandchildren singing "Have Yourself a Merry Little Christmas" — not yet a standard at the time but taken from Meet Me in St Louis, which was released only about three weeks earlier in 1944 — played on the camp intercom while he takes a shower. So far as I can see, what George Clooney thinks he is doing is relying on the expectation that the audience’s interest in himself and the movie’s other celebrities — besides Mr Clooney they include Matt Damon, Bill Murray, John Goodman and Bob Balaban, not to mention an utterly miscast Cate Blanchett — will by itself compensate for the inadequacies of the story-telling and the lack of any interest or emotion thus generated by the material apart from the stars. "There might not be another actor alive," writes the normally sober-sided Ann Hornaday of The Washington Post of Mr Clooney, "who so thoroughly personifies movie stardom, or deploys it so adroitly — as commodity, means of production and public trust." Gosh! Anyone might think that he, rather than that obviously bogus "Frank Stokes" was the hero who got our art back from the dreadful Nazis. Most egregiously, the movie poses and purports to answer but does not really take seriously the question raised by the material itself, which has to do with the worth of art in terms of human life. For a serious treatment of that question, you can always go to the DVD of John Frankenheimer’s The Train, which was even more loosely based on the same true story of Nazi art-lovers. That, as it happens, is also a movie in which sheer cinematic craftsmanship is raised to the level of high art. But Mr Clooney thinks, and he clearly expects us to think too, that this is an easy, even a banal question to answer. "That’s exactly what we’re fighting for: a culture, a way of life," he says glibly. So those who lose their lives in the attempt to recover the stolen art — or to keep it from the Russians — are presumably happy to die. But then the only ones who do die are the two foreigners, played by Jean Dujardin and Hugh Bonneville, who are presumably allowed to join this little band of all-American heroes on the strength of having had hits in America — The Artist and "Downton Abbey" respectively. At any rate, neither of them appears to have had any doubts about the matter. That’s just one of the unbelievable things about The Monuments Men. When Matt Damon steps on an unexploded land-mine, the stepping off from which may result in a fatal explosion, his celebrity buddies all gather, jokingly, around him before coming up with a surprisingly simple solution to what only moments before had seemed a deadly dilemma — something vaguely to do with a counterweight made from bricks. Then they all choose to continue standing close beside him when he steps off so that, just in case the solution doesn’t work (it wouldn’t dare! ), they will all die as well, in solidarity with him. Sure they do. Needless to say — Spoiler alert! — none of them do die. And so we are reminded yet again that this is war as imagined by people whose only idea of what war is like comes from movies. Accordingly, there are allusions to Saving Private Ryan and Casablanca, among others, in what must be an attempt to give a bit of heft to this incredibly lightweight stuff. They succeed only in reminding us how much it suffers by the comparison. On another occasion, Mr Clooney’s hero art historian interrogates a Nazi prisoner who won’t divulge the information he wants from him and who, of course, also turns out to have been in charge of a death camp. To display his righteous anger, Mr Clooney — for it is obviously he, rather than his ridiculous alter ego "Frank Stokes" — doesn’t get excited but instead takes and lights a cigarette, though he says he doesn’t smoke. Then he tells the man of his nice apartment on the Upper West Side of Manhattan which, upon his return, he expects to leave of a morning to have a cup of flavorful coffee and a bagel and read The New York Times in a nearby establishment called Sid’s Deli. No anti-Semite he! There, on or about page 18 of the Times, he says he will find a small notice of the German’s having been hanged for his crimes. Then he will think of the time he smoked a cigarette even though he doesn’t smoke. Huh? Is the German meant to be stricken by the bagel and the cigarette more than the prospect of his hanging? If so, the movie gives us no sign that he has been. The most unbelievable thing about this unbelievable movie is Mr Clooney himself as a scholar of art history, lecturing the President of the United States on "the greatest historical achievements known to man." This person not only briefs Roosevelt and the top brass with a slide-show on the important works of art he wants to save — "This is DaVinci’s "Last Supper" he tells the President, helpfully — but also explains to them the current disposition of Axis and Allied forces in Europe. Because, you know, otherwise how would they have known? The most fuss is made of Michaelangelo’s Madonna and Child from Bruges and the van Eycks’ Ghent Altarpiece, said (absurdly) by Mr Clooney’s scholarly hero to be "the defining monument of the Catholic Church," but we don’t see much of them or get much out of the experts as to what’s so great about them. We pretty much have to take on faith their wonderfulness, and that of the other works of art rescued by our heroes, along with their assurances of the vital importance of their mission. For apart from these examples, there are few works of art mentioned or displayed for our — very brief — inspection during the course of the movie, though "Frank Stokes" does think to ask who, if not he, "will make sure the statue of David is still standing, the Mona Lisa still smiling?" That, by the way, should give you some idea of Messrs Clooney and Heslov’s flair for dialogue. The works we actually see include Raphael’s lost "Portrait of a Young Man," here shown being burnt by the Nazis, presumably in obedience to Hitler’s "Nero decree" — which was about the destruction of German infrastructure that might be useful to an enemy and not art. There is also a glimpse of a self-portrait by Rembrandt (or should we say "van Rijn"? ), formerly in Karlsruhe though never before seen by the Jewish native of that city who, as a young American draftee from Newark (Dimitri Leonidas), serves as the men’s driver and German translator. 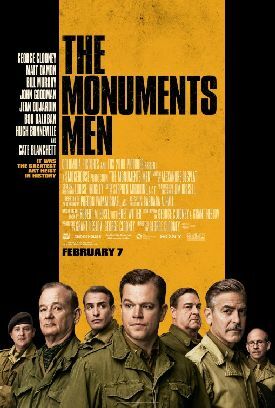 The Monuments Men marks a rare foray into optimistic, family-friendly filmmaking for Clooney and Heslov, both of whom are attracted to tough-minded, skeptical, even cynical movies. They made a pact on the last day of shooting, Clooney says, to go back to the dark side for their next project. "We want it to be low-budget, dark, screwy. . . . We want to have those scenes [like in The Ides of March] in the kitchen with Ryan Gosling and myself, where it’s just as dark and cruel as it can possibly be. We like that world a lot." Now there’s something we can all look forward to. But for me, you can’t get much more cynical than Monuments Men, a going-through-the-motions movie for which plaudits are expected anyway, not for the sake of the American and allied heroism it represents so poorly nor for the skill at movie-making it so signally lacks but just because you are who the hell’s in it.